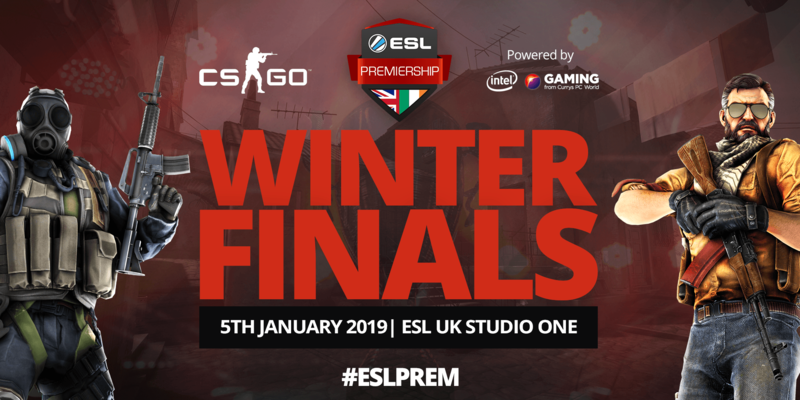 Tickets to the ESL Premiership Finals are now available over on ESL UK’s Eventbrite to watch the action LIVE alongside dozens of excited fans of the UK CS:GO scene. After three hugely successful ESL CS:GO Premiership Seasons in one year, ESL UK, in partnership with Intel and Gaming from Currys PC World, are hosting the 2018 Winter Finals at ESL Studio 1 in Leicester. The doors will be open to the public, welcoming CS:GO fans to come in and watch the action unfold live. The prize pool has seen a considerable growth in comparison to last year and the UK scene has even seen a few pros move on to play on the international stage. After an already exciting and action packed Year of UK Esports (#yearofukesports) ESL UK, Intel and Currys PC World invite the UK CS:GO community to Studio 1 in Leicester, to round up the year with the Winter Season 2018 Finals carried out on the 5th of January 2019! ESL UK has also been celebrating the successful progression for UK players into the international circuit. With players Owen "smooya" Butterfield and Rory "dephh" Jackson making it to the CS:GO Major and to many other prominent international events this year, having had their career pass through the ESL CS:GO Premiership. Not only that, but the prize pool for the 2018 season of ESL CS:GO Premiership has seen an almost 50% rise compared to the 2017 competitive season. ESL UK will have handed out £39,000 across all three seasons of ESL CS:GO Premiership once this winter final concludes, and £81,500 across all Premiership titles including League of Legends, Hearthstone, and Rainbow Six Siege seasons in 2018. ESL Premiership is here to forge the path to pro, allowing a team to gain the opportunity to advance through to the Mountain Dew League (MDL) qualifiers, where players from Europe and North America get their chance to prove that they are the best of the best, fighting for a coveted spot in the ESL Pro League. ESL are proud to provide continual support for the growth and development of UK esports, and are looking forward to hosting the community in their local Studio One in Leicester to watch the action unfold. We will witness four teams battle it out in a day packed with action as Endpoint, London Esports (formerly Stifmeister), Orgles5, and CeX fight for the title of the Winter 2018 Season Champions. Can Endpoint keep their title having won the Summer 2018 Season Finals? Or will the undefeated this season London Esports take it from them? Can Orgles5 continue their streak of defeating giants despite their recent roster changes? Or will CeX, the enthusiastic team of newcomers, be the ones to come out on top? Jacky Peters, On Air Talent for the Premiership has been an integral part of the team since 2015. “The Premiership is a way to show talent and nurture it. He’s also worked on expanding grassroot talent within the CS:GO scene, bringing in new commentators and analysts over the years to provide opportunities to rising talent. Can’t make it? No worries! The finals will be broadcast live on Twitch and Mixer, so you can cheer on your favourite teams from home as they fight for the Champions of the 2018 Winter Season title in the ESL UK CS:GO Premiership. Not up to date with the action? Make sure to head over to our Twitter, Facebook, and Instagram where you can read all about this ESL CS:GO Premiership Winter 2018 Season, see recaps, standings, and all things Premiership. If you are press and would like to work with ESL UK to cover the season final please feel free to reach out to ESL UK Press Team by sending an email to press.uk@eslgaming.com where they can assist with all requests.